The original post Tips on taking train from Singapore to Malaysia brings the most search traffic to my post. It’s been more than a year since the post went up and thanks for your support. Besides encouraging comments, I’ve also gotten A LOT of questions about this particular train route. Some questions were stuff I didn’t think about when I was writing the post while others were questions about stuff I’ve already mentioned in the post (this drives me nuts). Instead of answering the repeated Qs, I’ve gathered the questions here. 1. Where can I book train tickets from Singapore to Kuala Lumpur? 2. My online booking didn’t go through. HELP! 3. I picked Kuala Lumpur as my destination, why isn’t there a night train? 4. Is it safe to travel on the Malaysian train? 5. How do I get to [location in Singapore]? 6. Where do I board the train at Johor? 8. On the online booking, If I am coming to Singapore, which KTM train stop should I stop? 9. 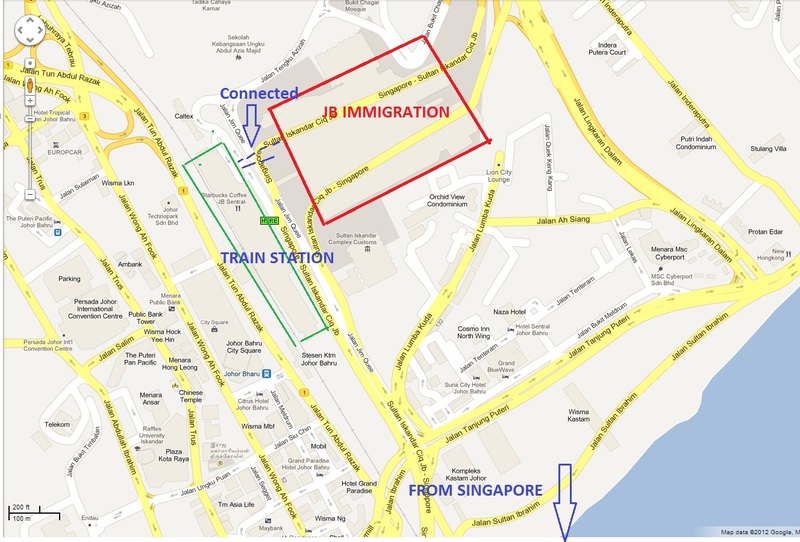 How do I get to JB’s train station from the rest of Singapore? 10. How much is the price of bed/seat/chamber/narnia’s closet? 11. How do I get to Bangkok on train? 12. Hey! Your post is about Singapore to Malaysia. But I’m in Malaysia, how do I get to Singapore by train? 13. Do they still give blankets for the common carriage? 14. I need to get to [location in Malaysia], can you help? FAQ begins here! I hate the formatting too! If you are booking online, the link is https://intranet.ktmb.com.my/e-ticket/Login.aspx Sign up for an account and you can check past reservations. You can also visit the train stations to buy the tickets but I don’t recommend doing that for night trains. Check your bookings in your account. I’m not sure what the phone number for KTMB is. Pick Sentral Kuala Lumpur, not Kuala Lumpur (which is one stop after KL Sentral). Have you watched too many wild wild west movies? I don’t think there are any robbers ambushing the trains. It’s safe. Check out http://gothere.sg/ or https://maps.google.com.sg/. There is a 24-hour KFC. A Starbucks is open until 10pm (I think). Pick Woodlands. This isn’t the Woodlands MRT, it’s a KTM train station near Woodlands MRT. If you are at Bugis, you can head to the Queen Street terminal where there are buses to JB. There are also Causeway Link buses to JB from Kranji and Newton. 11.How do I get to Bangkok on train? Just reverse engineer my tips for Singapore to KL. Pick Sentral Kuala Lumpur as your starting point and Woodlands as your destination. They didn’t have the thin sheet the last time I was on the morning sleeper to Singapore. Unfortunately, I come from Sabah so I am clueless about travelling in Peninsula Malaysia (unless I did research on it for a trip). Please check out the rest of the internet. Hello I was wondering if senandung sutera train stops at each station? Cos I have been trying to purchase ticket online but no successs if I put kluang as my destination. So i decided to buy ticket departing from woodlands to segamat with the intention to hop off mid-way. I don’t remember the stops because I was asleep when the train stops at different station. Based on your ticket purchase, they might not stop at Kluang. Hello there I ve just rang ktmb and they say I could just hop off at kluang. They dont sell the ticket online for the given route because of its short distance. There u go. Thanks anyway :) Cant wait to go home for raya celebration! Great news and Selamat Hari Raya! Will be taking the night train in a first class seat AFC. Would like to ask if you now what would be the best seat to reserve in the first class. We are a family of four (2 adults and 2 girl kids). My friends and i will be going to SG – KL this June, and will be riding the KTM in JB Sentral. Would like to ask if how many checkpoints(immigrations) we need to go through? I’m planning to travel to KL this September but there is “no data to display” on the coach for any train I’ve selected. What could this mean? I tried to check for availabilities until Dec but no data is popping up. I tried searching some time ago and seems like the night trains are all gone. I haven’t confirmed this with KTM though. You can’t book more than 30 days in advance, I have just found this out myself. So I waited a few more days to book in late September and today it allowed me to book them. Also make sure your choosing Kuala Lumpur Sentral, not Kuala Lumpur. Is it true that neaerly all night trains from SIN to KUL are delayed ? If YES do you know how many minutes/hours it can be ? Yes trains are always delayed by at least 30mins. And once the train arrives, it does not immediately leave.only after another 30 to 45 minutes. “advance booking just opened today at 0830hrs (30 days in advance including the travel date)”. Hope this helps future reader. Thank you! Thanks for the tip. :D Hope you have a wonderful trip. Thanks Zul, hope your trip was great. Just trying to book a train trip from JB Sentral to KL Sentral through KTMB E-Ticket as you suggested. I’m having trouble thought with selecting KL Sentral. There doesn’t seem to be any option in the Destination bar. Have things changed or am I doing something wrong? I pressed the “ticket reservation” bar on upper left corner to book. Is this right?